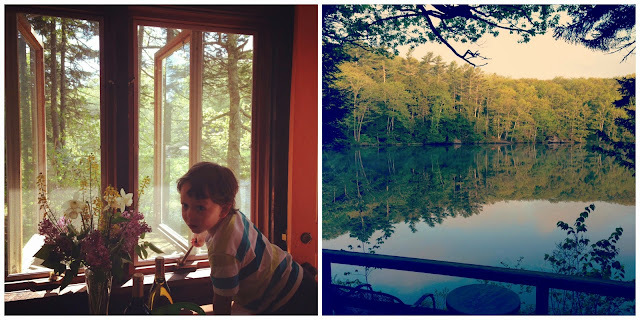 We have been exploring Maine for just over a week now and are feeling right at home. It was my intention to write nightly and post photos in a timely way but without a break in parenting responsibilities it has been a tough routine to create. While I overestimated the energy I would have at the end of every day to do anything at all productive, Andy joined us last Thursday night so I hope to find a groove this week. If you want to follow along in a way that more closely resembles real-time check us out on Instagram @BoldHeartMama. Our little house has an incredible lakefront view that we look forward to morning and night. The drive up was lush with Spring and all the way through Connecticut the landscape felt pretty much like Virginia does this time of year: leafy, rolling hills in shades of green, blue, and gray where distant mountains appear in layers at the horizon. We saw a spattering of brick and concrete through New Jersey and Pennsylvania but mostly it was winding roads through countryside. The kids were surprisingly cool about all the time spent in the car. It helped that my expectations were low and that I planned ahead in timing (they missed the last day of preschool so we could get an early start) and for ways to keep them well fed and entertained. We have been planning this trip for more than six months and their personal investment and excitement for all parts of the adventure was evident; everyone was pleasant, and cooperative for the duration. Unheard of. When we arrived at our hotel in Connecticut we ordered dinner in our room, and the kids' enthusiasm continued as they exclaimed love for the glasses we drank out of it, love for the bedsheets and comforter, love for the view of Hartford from our hotel window. They hugged and kissed each other a lot. After dinner we went for a swim and then fell asleep relatively early. The second leg of the drive began early the next morning and felt a lot more tedious because we were that much closer to our final destination, and the shorter drive just didn’t require the stamina that the previous day had demanded. As we left Connecticut and moved into Massachusetts the quintessential New England landscape emerged with steeples and rooftops poking up and out of fluffy textured tree cover. We stopped in Massachusetts for gas and to eat breakfast, then piled back in the car eager to cross into New Hampshire and eventually Maine. We were in need of escape from the confines of the car, Maple's Creamery to the rescue. I had a lot of anxiety leading up to this trip, a function of my usual catastrophic thinking mixed with a little fear for embarking alone with the kids on a six week stay in an unfamiliar house and town. As the minutes to arrival counted down on GPS, and as I finally set sights on the sign that marked our street, and then turned off the main road on to a dirt drive my heart lifted a little; and when I parked the car on a little flat spot above the house and caught glimpse over the rooftop and through the trees of sunlight sparkling on the lake I felt awash with relief. This town, this house, this lake, they really do exist! Keep the goodies out of sight until you really need them: I kept all the activities that I packed for the kids up front with me until the circumstances or attitudes warranted a change. We started the drive with only the usual suspects: a snack, their books and magazines (National Geographic Kids, High Five, Ranger Rick Jr.), and their saved Playmobil and Lego catalogs). I made a rule that whenever one kid napped the other could use the iPad to watch a movie, which bought me double the quiet time because they each took naps at separate times. Timing the road trip around naptime is probably an obvious help. Before we left I downloaded a selection of the movies we own from Apple TV and also bought a few new game apps for the iPad (Toca Builders, MineCraft, and Lego Juniors). Minecraft is too advanced for Merritt but Roscoe has taken to it easily. We love audiobooks for car travel because they keep the kids’ attention while still allowing them to stay engaged in what's happening in the car and out on the road–audiobooks don't seem to engross them in the same way that dvd players do. The kids have really enjoyed The Cat and the Hat and Other Stories, so for this trip I downloaded My Father’s Dragon, which is the perfect storyline for up-and-coming kindergartners, and probably young elementary kids too. Open ended, and fascinating in a tactile sort of way, the kido freeplay magnatab was a huge hit. The pen brings the little magnet balls to the surface and then they use their fingers to push the designs down. Another travel must-have was the On-The-Go Colorblast notepad by Melissa and Doug, which held their attention for a long time. I loved stuff like this when I was a kid too. Pack a cooler of portable snacks: I brought a small cooler with a big waterbottle of diluted juice and another filled with water; portable yogurts and applesauce; grapes and bananas; cheese; peanut butter and jelly sandwiches; fruit snacks and fruit leathers; and gum for chewing. I also packed two meals for them that served as lunch, but these extra snacks and treats kept everyone happy in between meals, and we had plenty leftover for our second day of travel. Throw in a few unexpected surprises: I brought along a package of freeze-dried Neapolitan ice cream developed for astronauts. The kids thought it was very interesting and we had the opportunity to talk about why in the world would astronauts need to eat their ice cream freeze-dried and out of a pouch. If you are a frequent traveler, or infrequent like us, what do you find works best to keep your littles happy while on the road?